Last year I had the pleasure of working with PHILADELPHIA Cream Cheese and some of its related products. It was a ton of fun to use in recipes and share with everyone here. So this year when Kraft asked me to test out the Spicy Jalapeño cream cheese spread I was very curious to try. See overall I am not a Jalapeño person. I like spicy and I like bit of Jalapeño cut up in my salsa, but since this was a test, I was very up to the challenge. I make my daughter try her food at least once, so in the spirit of the same precedence, I took on the challenge. PHILADELPHIA Cream Cheese has been making America’s favorite cream cheese since 1872. Due the high standards and commitment to a quality product, they use fresh milk and wholesome cream. Fresh milk from nearly farms is made into cream cheese and goes from farm to ridge in only 6 days. In the PHILADELPHIA cream cheese spread I tried, they use crisp jalapenos to provide its delicious taste. Now initially when I tried the spread, as a non Jalapeño girl, I was like WOAH. It is spicy. Like it knocked my socks off, but the flavor was good so I knew that I could make this into a recipe easy. When you are recipe developing its so challenging. After all, I am not a cooking blogger, I am a just a cooking mom. And a mom that stands in the kitchen and often stares into my fridge with the “what am I gonna cook” stare at that. Initially I had this thought process to tame down the spicy and do something with it sweet. I tested out all sorts of pumpkin and strawberry kicks but didn’t ever quite get there. (which explains the picture above) However when I embraced the spicy, I found the PERFECT marriage for it and I hope you enjoy as well. 1) Empty container of Spicy Jalapeño Cream Cheese Spread into a bowl and 1 cup of black beans from a can. Mix with a fork. Do not overmix. 2) Add 2 cups of shredded cheese, pick your favorite flavor! Mix with a fork. 3) Lay out wonton wrappers and put spoon full inside and seal. 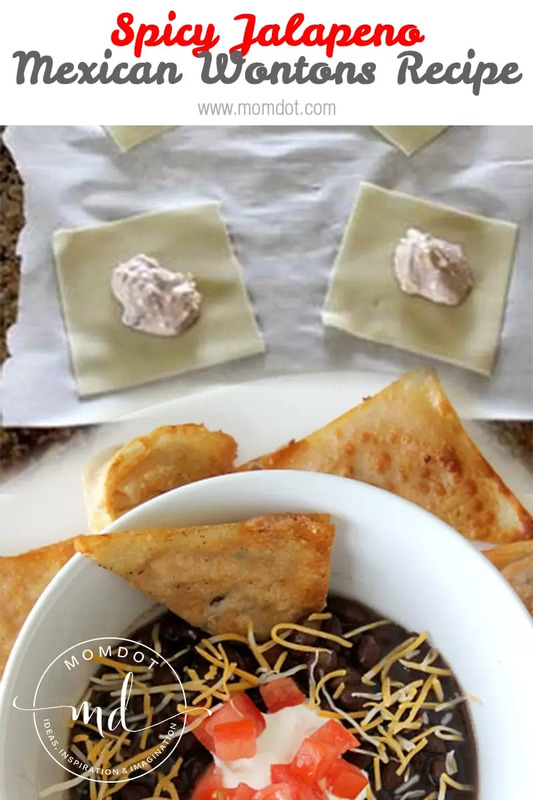 Wontons can be tricky to seal. You fold in a triangle and then grab either end and bend together. or you can seal like a triangle and leave it there. If you are dipping, I would go with the triangle method. Make sure you brush your wonton wrappers with egg whites around the edges before frying up. Follow wonton wrapper instructions for frying in pan. 4) Remove from heat and serve up immediately with a bowl of sour cream, salsa, or extra black beans! These came out perfect and my husband said “Wow, those are good!” and I totally agree. Great for football games, gatherings, parties, appetizers, or even a meal, just like any Mexican dish there are so many ways to develop it. Love this recipe? Make sure you Pin it and save! Now you can head over to CreamCheese.com for more recipes like mine and pick up Spicy Jalapeño Cream Cheese spread to try your own recipe! And do not forget to check out the No Kid Go Hungry initiative that PHILADELPHIA is involved in. You can help kids get meals in America just by sharing a video from their Youtube! You tell me, how would you use Philadelphia Spicy Jalapeño Cream Cheese Spread? Do you like Jalapeños? Disclosure: I have been selected by Kraft Foods to be an ambassador for PHILADELPHIA cream cheese. While I have been compensated for my time and recipe development, my opinions above are my own. Sounds very spicy, but looks so good! You know the beans really tamed it down! Mmmmm these sound so good. I will definitely have to make these – soon! This reminds me of an amazing wonton recipe that I created – I need to share it! My husband would LOVE these! I’ll have to prep some so he can try them next time he makes fish! Thanks! Oh yummy! I have a household of boys that love Jalapeno’s so I can’t wait to try this recipe. Hopefully they won’t be too spicy for me. These look incredible! I recently learned that I actually love jalapeños, so I totally need to give these a try. I love most things spicy and this Philly cream cheese hasn’t even been on my radar until now. 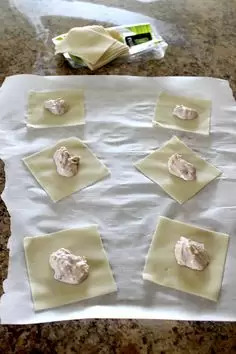 I’m definitely going to try this recipe out even though I’ve never worked with wonton wrappers before. Yum! The first time I used them I got a recipe from a blogger that did some sort of cream cheese and cinnamon sugar thing. They were DIVINE! I made them over thanksgiving. I have such a weakness for cream cheese. And cheese. And wontons. Also jalapeno. So basically, these are like my dream food. I love how easy they are too!